Aeroflot has been once again recognised as the Favourite International Airline in China. Aeroflot has once again won the prestigious international Randstad Award for best employer in the transport industry. Aeroflot Group airlines triumphed in five main categories at the prestigious Wings of Russia national aviation award. Aeroflot’s Public Council today held its first meeting of 2018. Aeroflot has been named one of Europe’s leading airlines for a second year by TripAdvisor, the world’s largest travel site. Aeroflot Deputy CEO for Legal and Property Matters Vladimir Alexandrov and Viktor Blazheev, Chancellor of the Kutafin Moscow State Law University, (MSAL), today signed a formal cooperation agreement at the Moscow Legal Forum. Aeroflot has been ranked one of the world's 10 leading full-service airlines by a study of more than 60,000 passenger reviews by online travel agency eDreams. PJSC Aeroflot (Moscow Exchange ticker: AFLT) announces the results of the extraordinary Board of Directors meeting held on 19 March 2018. PJSC Aeroflot (Moscow Exchange ticker: MOEX) announces the results of a meeting of its Board of Directors held on 15 March 2018. The meeting was chaired by Mikhail Poluboyarinov. 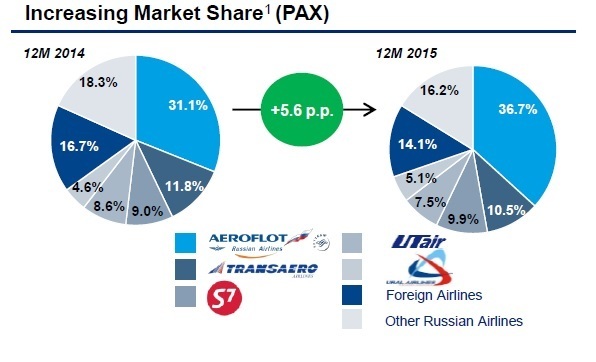 Russian airlines started to expand their fleets as the passenger demand grows. A surprising recovery in Russian air transport revenue growth could also be the beginning of a new soap bubble. Russian leasing companies finds ways to re-market the fleet of the collapsed second largest customer Transaero Airlines. The industry continues to suffer virtually no growth in all areas. Founded in 1923, Aeroflot is Russia’s oldest and largest airline – and over 93 years has become a global icon for the nation. Based at Moscow’s Sheremetyevo Airport, it operates services to 131 destinations in 50 countries, including 45 destinations within Russia, as per its current summer schedule (March 27 through October 29, 2016). Aeroflot’s modern fleet, which is now among the world’s youngest, consists of 188 aircraft, including the latest Airbus A320 family of airliners, as well as Airbus A330s, Boeing 737s, Boeing 777s, and Sukhoi Superjet 100s. In 2007, Aeroflot signed a contract for the purchase of 22 state-of-the-art Airbus A350s. Last year, Aeroflot carried 26.1 million passengers (up 10.6% year-on-year), flying 74.1 billion passenger-kilometres (up 10.4%). The average load factor reached 79.3% (+1.1 p.p.). 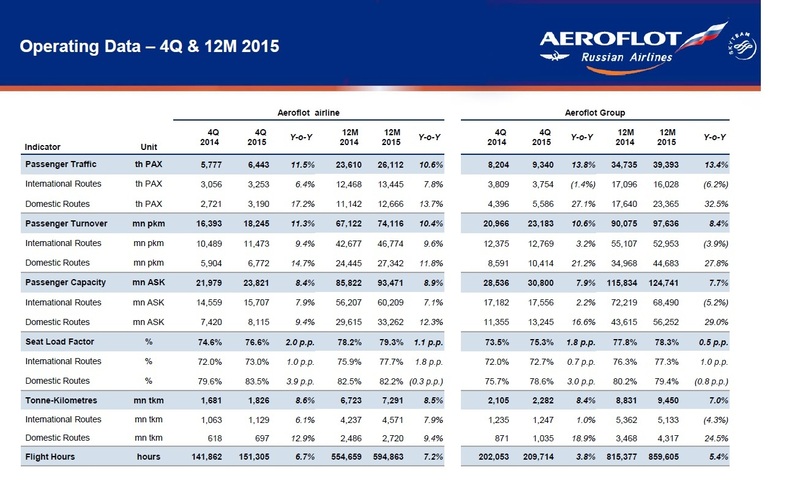 A total of 39.4 million passengers (up 4.7%) were carried by the Aeroflot Group, which includes subsidiary airlines Rossiya, Aurora and low-fare operator Pobeda. Aeroflot belongs to a number of select air transport organizations. It became the first Russian airline to join the International Air Transport Association (IATA) in 1989 and, in April 2006, became a full member of SkyTeam, the world’s second largest airline alliance which, through its vast combined network, offers services to 1,057 destinations in 179 countries. Aeroflot also operates code-sharing agreements with 28 Russian and international airlines. Since 2011, Aeroflot has been a member of SkyTeam Cargo. The Russian government holds a 51% stake in Aeroflot. The remaining 49% belongs to legal entities and individuals. Vitaly Saveliev has been Aeroflot’s Director General and CEO since April 10, 2009. According to the 2015 IFRS consolidated financial results, Aeroflot Group’s revenue reached 415.2 billion rubles, up 29.8% year-on-year. The EBITDA margin was up 9.6 p.p. year-on-year to 24.8%; the EBITDA margin was up 6.3 p.p. year-on-year to 14.1%. The group’s operating profit more than tripled year-on-year to 44.1 billion rubles.